It is known that birds eating a seed based diet typically have nutritional deficiencies. To aid in the nutritional wellness of pet birds, pelleted and extruded diets have been developed with the intention of providing balanced nutrition in a convenient form. Each nugget of a high quality pelleted food contains nutrients from all food groups, eliminating deficiencies that can arise with selective eating. It is important to remember, however, that pelleted food alone does not provide sufficient physical or mental stimulation for companion birds and based on age, species, health and lifestyle, should only represent 50-80% of a bird’s total diet. This handout is meant as a guideline for introducing and converting a companion bird to a pelleted diet and should be read in conjunction with our Bird Care handout for a complete overview of feeding your pet bird. It can be challenging to convert any bird to a new diet, as the bird must first learn the new item being offered is, in fact, food and then must select that item to eat. The time required for complete conversion can vary with each individual bird, so patience and persistence is necessary. In the end, the long-term health benefits of a formulated diet will make the effort well worthwhile. Count the number of droppings normally passed by your bird in 24 hours to establish a baseline prior to the diet change. 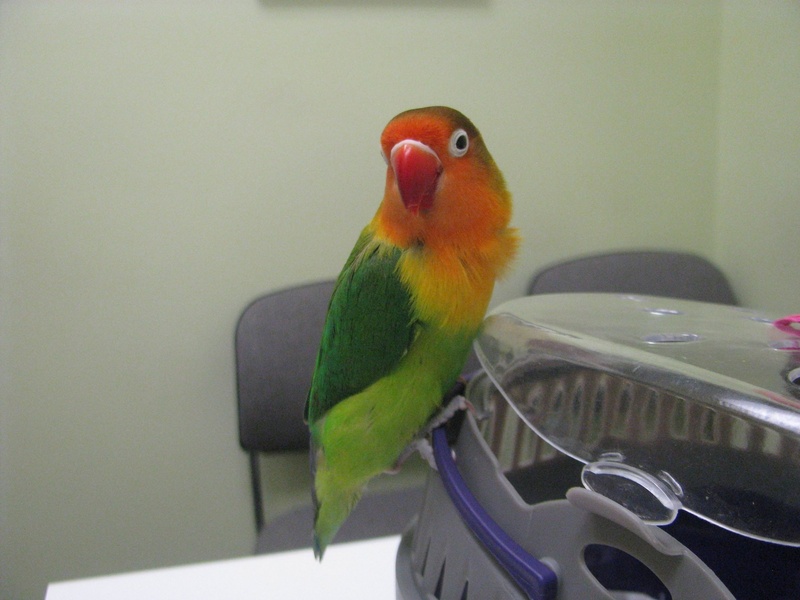 Track your bird’s weight and body condition during the conversion process. Follow a conversion plan and be willing to backtrack if the conversion process is happening too rapidly for the bird. Remember conversion can take anywhere from a few weeks to months to complete. 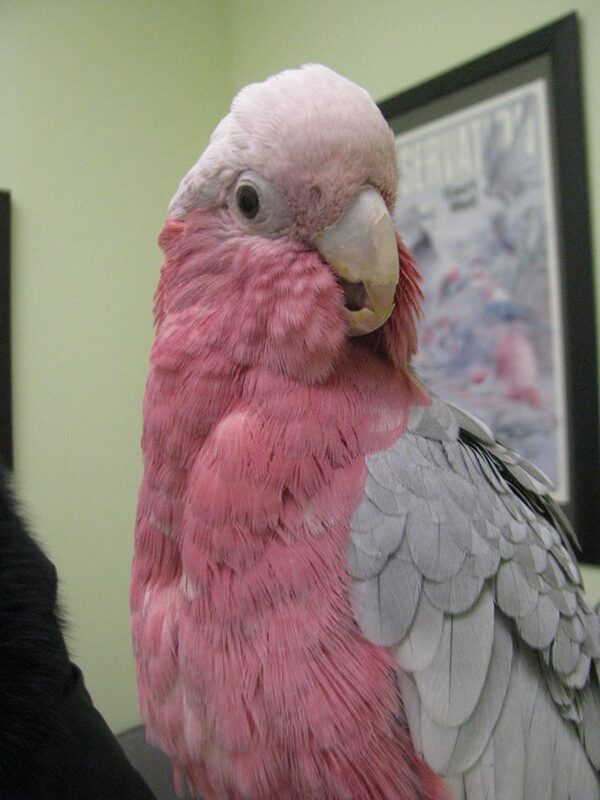 Certain mutation cockatiels, lovebirds and budgies have been found to develop kidney disease if fed a high percentage of pellets over a long period of time. We recommend restricting pellets to 50-60% of the total diet for these birds, reintroducing seed three times a week once conversion is successful. A good formulated diet should come in a variety of sizes to accommodate all sizes of birds. Vitamin and mineral supplements should be discontinued once the bird is eating 40% pellets unless otherwise directed by your veterinarian. Remember that a bird can become overweight if overfed. Once the bird has successfully converted to a formulated diet, make sure to measure the amount given each day, following the recommended guidelines for each species. Finally, never assume the bird will eat the pellets ‘if it gets hungry enough’. Until the bird learns that the pellets are food, its regular diet should be offered. Birds have a rapid metabolism and can quickly starve to death during a forced conversion process. 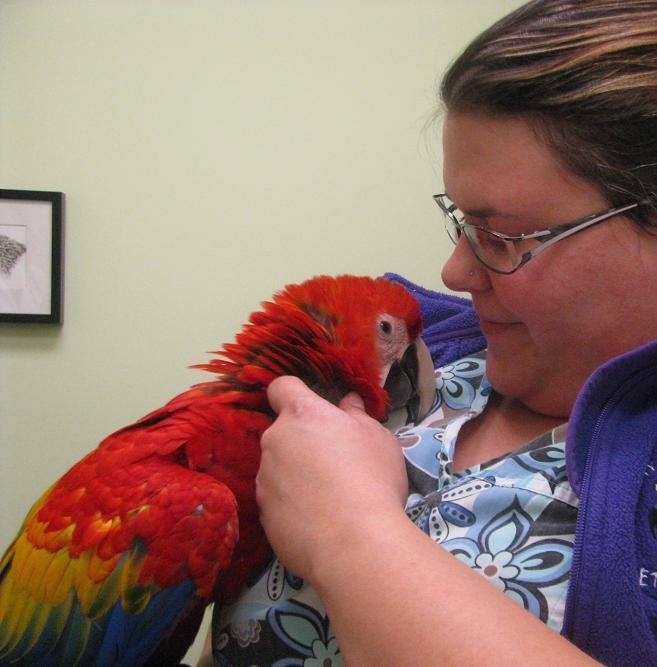 Converting a parrot to a pelleted diet can be as simple as offering the bird a pellet to eat! With some pet birds, if a food item is presented by their owner, or during feeding time, the bird will automatically give it a try. Engage the bird’s interest in the pellets by using an already recognized food item. If the bird loves a certain fruit, squeeze the juice of that fruit on the pellets. Mush the pellets up with cooked potato or peanut butter on toast – or embed a pellet into a banana. Use whatever the bird already likes to encourage it to taste the pellet. Mix the pellets with the usual seed diet and always have a dish of pellets available to the bird. Once the bird begins eating the pellets, gradually reduce the seed. Sometimes, the idea that another bird is eating a food item will encourage a bird to try something new. Sprinkle some pelleted food on a flat table surface and set your bird next to it. Then, use your index finger to ‘become a bird’ and peck at the pellets on the table. Every now and then, take a pellet between your thumb and index finger and ‘crack’ it with your nail, to mimic cracking seeds. Knock a couple of pellets in your bird’s direction and continue to ‘forage’. Don’t try and hand the bird a pellet and don’t pretend to eat a pellet with your mouth – this has to do with mimicking a bird (your finger) foraging for food. We have ‘converted’ birds in 5 minutes in the exam room! Once your bird tries the pellets, forage with your bird every night for the next several nights and begin mixing the pellets into the seed dish (see the conversion table). For birds less inclined to interact with their owners, utilize this ‘competitive’ feeding nature by sprinkling the pellets onto a mirror placed on the cage bottom. When the bird bends and sees another bird reaching for the food – it is inclined to try and get it first! Always make the pellets available in a dish high up in the cage – birds will often be attracted to the food item that is the ‘highest in the tree’. Because many seed eating birds will pick at seeds and grains embedded in breads, making a birdie muffin (Harrison’s Bird Bread®) and sticking the pellets into it can encourage the bird to ‘pick out’ the pellets. The bird bread itself will aid in nutrition and foraging stimulation. The following table sets out one protocol for conversion as recommended by Harrison’s Bird Diet® and can be used for converting from seed to mash, mash to pellets, or seed to pellets. Always consult product packaging for suggested feeding volumes as recommended by the manufacturer to determine how much your pet should be fed per day and modify this schedule accordingly. If you find that your bird avoids the food dish at any time, go back to the previous step and extend the process. There are some useful fatty acids in certain healthy seeds that can be added back into the diet once the bird is eating pellets. Offer your bird one teaspoon of millet or flax seed every 2 to 3 days. THIS INFORMATION IS MEANT AS A GUIDELINE ONLY AND IN NO WAY REPLACES CONSULTATION WITH AN AVIAN VETERINARIAN.